Coconut or nariyal is an essential in every Indian home and so is coconut oil. Whether you use coconut oil for cooking or not, it is still a staple and is present in almost every house in India. Being a tropical country, this wonder nut is grown in most coastal parts and easily available in rest of the country too. Coconut is a wonder fruit /nut as well as super food, which serves mankind in every form. It can be eaten raw as coconut water, which is again considered the best supplement to keep body hydrated and also provides necessary electrolytes naturally. The fruit itself is versatile and can be had as is or made into chutney, curries, dals etc. Coconut is rich in oils and is used to extract oil which is used in numerous ways. It is a sweet tasting oil and can be extracted by cold pressing as well as hot extraction process. We will explore some of those benefits here in this article. Coconut oil is one of the best emollients. You can use it for moisturising children’s skin when it gets a bit dry. Daily application of coconut oil helps to keep skin soft and supple. Massage for babies is an essential part of routine. But many oils like mustard or olive oil do not work well during summer. 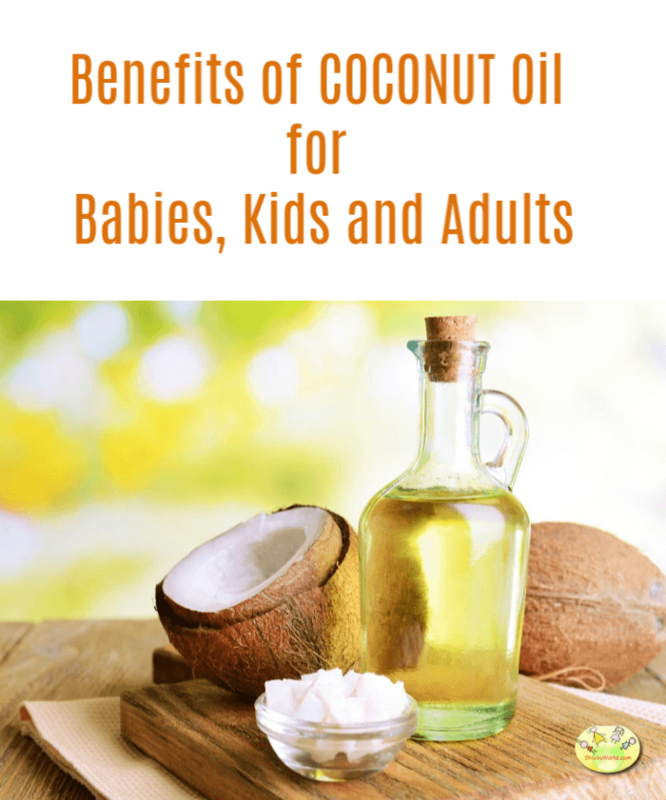 Coconut oil works the best for massage babies as well as older kids during summer. It is naturally cooling and provides coolness to body. Massage with lukewarm to room temperature coconut oil before or after bath. It gets absorbed easily and keeps the skin very soft. Say bye to frizz with coconut oil hair massage. Forget about all those chemical treatments for hair to keep them healthy and moisturised. Indians have been using coconut oil for fair massage for ages. My mother does it and so do I and I also apply it on my daughter’s hair. My mother at the age of 70 barely has any grey hair. And even us, who are not so diligent as her have soft, black, straight hair. Simply take the oil in your finger tips or a cotton ball and apply allover the scalp. Finally give a good massage with finger tips and plams of your head. It hydrates your hair and locks the moisture in. Coconut hair can also be used to soften cradle cap or dandruff in babies’ head which can then be washed away with shampoo. Coconut oil can be heated to high temperature, so it is safe fo almost all kinds of cooking. The taste may take a little getting used to but many states in India like Kerala use using coconut oil for all their cooking. Coconut oil is one of the best home remedies for rashes specially diaper rashes. It not only soothes skin and cures them but also stops them from coming back. Apply a thin layer of coconut oil to your baby’s bottom every time you change diaper. Coconut oil works great on light bruises and burn marks. Apply coconut oil of the bruise and it will gradually fade away. If your child has excessive dry skin or even mild eczema, coconut oil can help by moisturising the skin. Apply enough oil two to three times a day. You can use pure coconut oil to fight skin allergies and infections. It has been established that coconut oil has anti-fungal and anti-bacterial properties and helps to fight infection. Coconut oil head massage will also help if you have dandruff problem. I have stopped buying makeup remover, as there is nothing better than some coconut oil on a cotton ball. Use it to wipe off all the goo from your face and then follow if up with cotton dipped in rose water if you want. Perfect, clean face! Is Having Too Much Coconut Oil Unhealthy ? According to the popular belief, we must avoid a lot of saturated fat. Coconut oil, however also gives good HDL cholesterol. Coconut oil has been used in some parts of India for all of their cooking and it hasn’t caused them to be any less healthier than the rest of the country. In fact, the west is waking up to its benefits now and many practitioners there recommend adding a spoonful of coconut oil to food everyday.